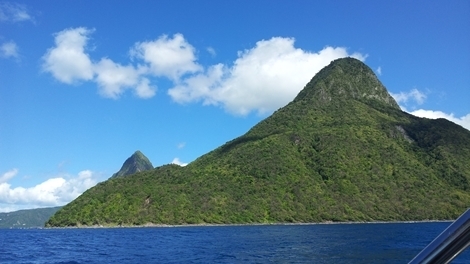 St Lucia is undoubtedly one of the most beautiful tourist destinations in the world. But is the enjoyment of this beauty compromised by the potential danger of a visit? St Lucia is home to beautiful beaches, incredible wildlife and stunning views from the Gros Piton peak, which towers over the island. This 798-metre high mountain is a favourite of the travel guides, alongside the likes of Rodney Bay and Hummingbird Beach, and a host of sporting and leisure activities made possible by the island's diverse terrain. The easy beauty of these locations is something to behold, but travel advice for St Lucia does not look so pleasing. Vigilance and security are essential for any travel on the island and tourists journeying between different destinations without a knowledgeable guide risk wandering into areas associated with gangland activity and violent crime. A record 60 deaths were recorded in 2017 on St Lucia, placing the island, which has a population of only 180,000, in the top 10 most dangerous places on Earth. At the time of writing, St Lucia had already witnessed 27 homicides, with numbers expected to rise before the year is out. Most visits to the island remain, thankfully, unaffected by its violent crime epidemic. But most visitors also stay on cruise ships or in secure hotel resorts protected by large walls and armed guards. Locals bear the brunt of St Lucia's violent crime epidemic, and clearly, the authorities on the island need to address this, but yachtspeople, backpackers and visitors who stray off the beaten track in search of the ‘real St Lucia' are in danger too. We would urge anyone considering a trip to St Lucia to also consider the practicalities of that trip. Consider whether you can reach the island's renowned sites safely and, indeed, whether a holiday in St Lucia can deliver everything it promises whilst travelers need such restrictive security measures? The solution to St Lucia's ills lies with its leaders, and - in particular - requires them to create an atmosphere of security and safety for all, locals and visitors alike. The most basic requirement of all is a functioning criminal justice system, which is something that St Lucia does not have at the moment. There have been challenges in this regard for a great many years, but these are all the more acute at the moment given there are currently no functioning criminal court facilities on the island and all all criminal cases have been suspended. Not only does this delay justice further for the victims of crime, it means that those accused of crimes continue to languish in jail without the opportunity to plead their case. The high levels of crime and the lack of a functioning justice system also constrains the potential of its tourist economy, which enjoys so many rich tourist assets and such stunning scenery.